- Fierce facial expression, accetuated by the dark smudge in front of the eye. Expression not unlike European Herring Gull. - Upper parts rather dark grey; much darker than in cachinnans and barabensis; but slightly paler than fuscus. - Late moult timing of the primaries. In this individual, all old outer primaries have been shed, but only P8 is full grown. P9 & P10 still growing. - Most reliable feature for heuglini might be the bill, which can look very cachinnans-like: slender, without a clear gonydeal angle, pale yellow. The gonydeal spot is often rather orange-red, not as deep coral red as in western LBBG taxa. 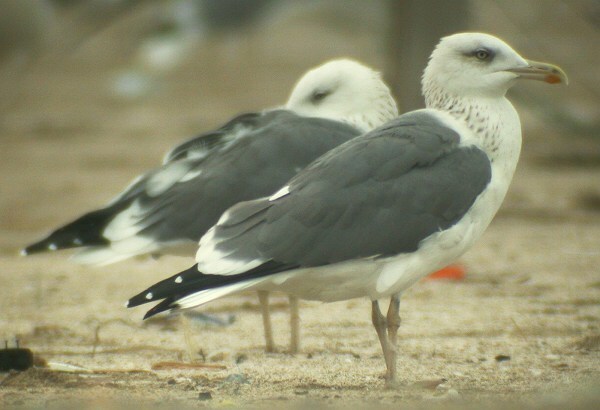 This, together with the sloped head makes the bill look longer than in most intermedius LBBG.